On this date in our family history . . . the 7th day of August . . . in the year 1789 . . . another baby boy is born to my 5th great-grand-parents, James and Nancy Ann (Tate) Anthony . . . given the name of Milton, this baby is believed to be the 9th of eleven known children in this family, the 6th of which is my 4th great-grandma, Nancy Tate (Anthony) Davis (1783-1871) . . . besides being a younger brother of great-grandma Nancy, this Milton is also the father-in-law of my 2nd great-grand-aunt Margaret Frances (Davis) Ant(h)ony (1833-1912), who is buried beside her husband, Dr. Milton Ant(h)ony, Jr. (1824-1885), in the Old City Cemetery in Rockdale, Milam County, Texas (my hometown) . . . regarding this Milton, the following is from the History of the Medical College of Georgia . . . Despite a limited early education, Dr. Milton Antony began to study medicine at age 16 as an apprentice. He took a course in Philadelphia but could not afford to continue and never received a diploma. He began his practice in rural Georgia, and soon built up a large practice. After seven years, he moved to New Orleans for a short while and returned to Augusta in 1819. He became very active professionally and determined to improve the quality of his profession in Georgia. He was a member of the Medical Society of Georgia and with his urging, the Medical Board of Georgia was established which regulated the practice of medicine. 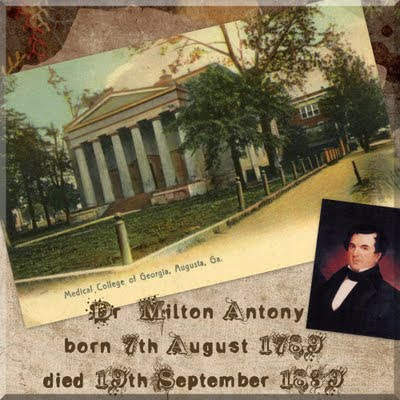 In 1828, Dr. Antony, along with three other physicians, founded an academy of medicine to prepare students for further medical studies, soon expanded to become the Medical College of Georgia. He shepherded the building of a permanent home for the new school, which resulted in an impressive Greek Revival building. In 1836, he and his colleague, Dr. Joseph Adams Eve, began the Southern Medical and Surgical Journal to report the medical advances and practices of the South. Besides Dr. Antony's contributions to the profession itself, he was also a fine surgeon, and reported on his bold surgery to remove a portion of a diseased lung by partially removing the fifth and sixth ribs. Dr. Antony enjoyed an excellent reputation both in and outside the state. As the yellow fever epidemic swept through Augusta in 1839, Dr. Antony became one of its victims. He was buried on the grounds of the original Medical College of Georgia building. Meanwhile, back here in Texas, there is an article about one of Uncle Milton's grandsons available at The Portal to Texas History, which mentions the following . . .
. . . The elder Antony was an eminent member of his profession, being for years editor of the Southern Medical Journal of Augusta and dean of the faculty of the Georgia Medical Journal of Augusta, of which he was one of the founders. He died in 1839, of yellow fever, making his life the last offering to a profession which he had long adorned. He left a scholarship to each of his sons in the institution with which he was connected, six of whom availed themselves of the privilege and became regular practicing physicians. . . .
Lewis Publishing Company, publisher.. History of Texas, together with a biographical history of Milam, Williamson, Bastrop, Travis, Lee and Burleson counties : containing a concise history of the state, with portraits and biographies of prominent citizens of the above named counties, and personal histories of many of the early settlers and leading families. Chicago. The Portal to Texas History. http://texashistory.unt.edu/ark:/67531/metapth29785/. Accessed August 7, 2009. The above postcard collage -- highlighting a postcard showing the Medical College of Georgia -- was originally posted for the 7th of August 2009 edition of Postcard Friendship Friday which was hosted weekly by Marie Reed. P.S. Click on this image (originally uploaded at flicker.com by National Register) to read more about the Old Medical College. Your blog is so pretty. I love what you did to display the postcard. I really like how you took the old postcard and personalized it like that! I love the way you research and share all your awesome family history. You have really spent a lot of hours and time in order to share each week. I am truly in awe . Blessings to you for the rest of the weekend. 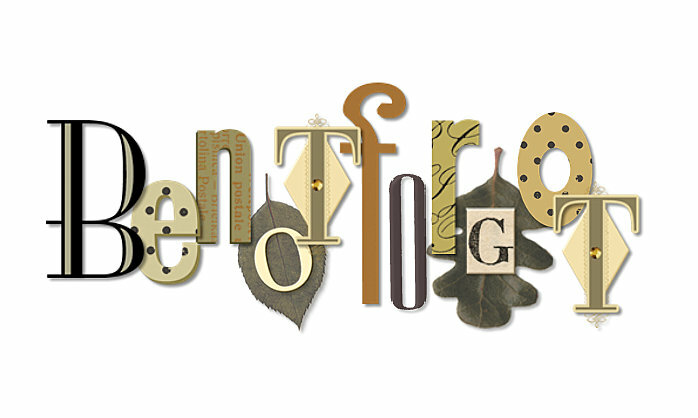 Your history is interesting,and I like the design of your collage and blog too. I agree with everyone above I love the history, the postcard, the post. Thanks for sharing the information too. I really do love your blogs and you get a mention in my this coming Friday.